Mercedes’ Valtteri Bottas sat top of the pile at the lunch break on the final day of the first in-season test in Barcelona. 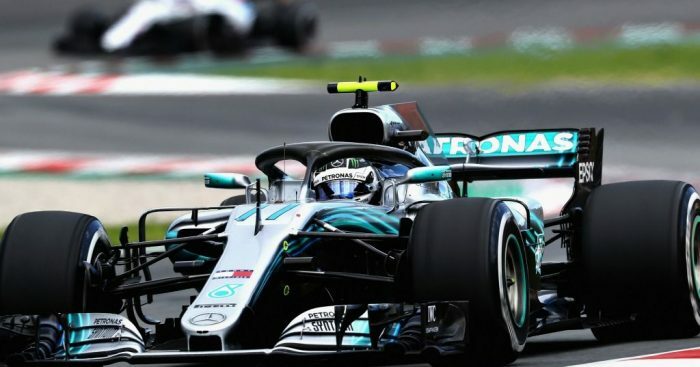 The Silver Arrows and Ferrari found themselves trading places at the top inside the last hour of the morning session, with Bottas eventually coming out quickest with a 1:16.904. The Finn was 0.068 seconds faster than Antonio Giovinazzi who, after spending all of Tuesday in the Haas car, was back in his Ferrari overalls to take over driving duties from Sebastian Vettel. Rounding off the top three at the hour interval was Kevin Magnussen, fresh from his P6 finish in last Sunday’s race at the Circuit de Catalunya. British drivers Lando Norris and Jack Aitken, representing McLaren and Renault respectively, completed the top five as thickening clouds rolled in at Barcelona. Robert Kubica was back in the Williams FW41 again after his FP1 stint on Friday and held down P7 with another 56 laps under his belt. Three tenths ahead of the Pole in P6 was rising star Charles Leclerc, back on duty again following back-to-back points finishes in Baku and Spain. Force India’s Nikita Mazepin, McLaren’s Stoffel Vandoorne – testing Pirelli prototype tyres – and Red Bull simulation development driver Jake Dennis made up the rest of the top 10. Pierre Gasly will take over from Sean Galael in the Toro Rosso STR13 this afternoon, while Oliver Turvey is due to get back in the MCL33 after first taking it for a spin on Tuesday. The afternoon session, and the two-day test, will finish at 1800 local time.